If you're planning your first ski trip, you're probably nervous about learning the skill while avoiding being run over by more skilled skiers and snowboarders. Those are natural fears. Skiing is kind of crazy when you think about it - you strap two long flat objects to the bottom of your feet for the sole purpose of flying down a snowy mountain as fast as you can. If you don't know how to control yourself very well, that could lead to all sorts of disasters. Luckily, ski resorts are aware of the problems beginner skiers face, and a number of them put facilities and procedures into practice to mitigate those problems, making your first ski trip the best it could possibly be. Breckenridge, located in Colorado, offers a full-service ski and snowboard school with lessons for children, adults and special populations. They have 600 acres of terrain groomed daily and eight separate trails dedicated specifically to beginner-level skiers. Keystone, also located in Colorado, dedicates 20 percent of its more than 3,000 acres of skiable terrain to beginner-level skiers. That means that as a beginner, you can cover more than 600 acres of terrain with confidence. Deer Valley, located in Park City, Utah, has some of the best, driest snow in the country, making it easier for newbies to get a hang of the sport. One of Deer Valley's peaks, Bald Eagle Mountain, has a separate beginners area with two lifts specifically for this terrain. This means you can ski without worrying about getting bombarded with more advanced skiers. For individuals living in the northeast, making a trip to Sunday River might be your best option for beginners skiing. This Maine ski resort has 33-percent of its slopes dedicated to beginners, with an additional 36 percent for intermediate-level skiers. Snowmaking also covers 92-percent of the mountain, ensuring the "most reliable snow in the northeast." Located on Mount Hood in Oregon, Timberline Lodge is famed for being the backdrop for the movie The Shining. Luckily, beginners don't have to be scared when skiing at Timberline. Their website provides practical, no-nonsense tips on making your first time skiing a success, plus they offer an excellent ski school dedicated to getting you confident and assured before sending you off on your own. Telluride, another Colorado, Rocky Mountain resort offers excellent trail maps and markings that help ensure beginners won't ever stray off the safety of the green trails. If you're looking for a good ski resort for beginners that's a little closer to home, check with your local resorts to see what types of offers they have for beginner skiers. 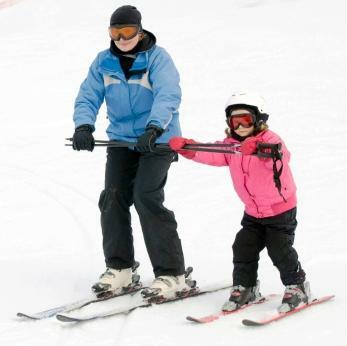 Most ski resorts offer a ski and school package that allows you to take advantage of a lesson, rentals and a ski pass for the day. Also, when you're purchasing your tickets or other passes, make sure you communicate to the ticket seller that you're new to skiing. They may have special deals, or they may have tips for how to stay away from crowded areas and master your skills on the bunny slopes before hitting the well-traveled downhill trails. Almost any resort can end up being the best resort for beginners, you just need to communicate your concerns to the resort staff and ask for help as you learn the skill.